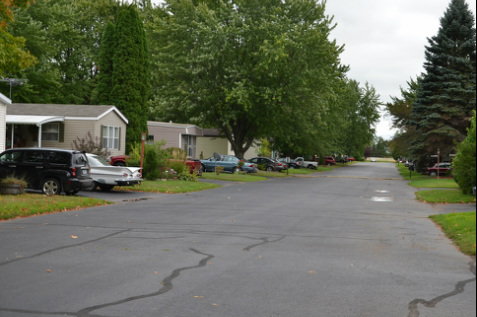 Stone Gate Mobile Home Park opened in the early 1950s and has grown up over the years into a 50-site, resident-owned manufactured home community. But that transition didn't happen overnight. We began the move toward controlling our own destiny in early 2012. That's when, with the help of the Northcountry Cooperative Foundation and ﻿ROC USA®﻿, we formed the Stonegate Cooperative, that would, on September 7, 2012, purchase and take control of our community. Now, Stonegate is not only a successful business, but also a thriving neighborhood. The process of the cooperative buying the land beneath our homes brought this community closer together. Not only do we know far more of our neighbors than ever before, but we look out for one another, too. And with no outside landlord to report to, we're the envy of other nearby manufactured home communities. ROC – something about which we're not only happy, but also proud. We're running the multi-million dollar business that is our community on our terms, by our rules, for the betterment of ourselves and our neighbors. Stonegate couldn't be better situated. Lindstrom is known for its many lakes providing access to a vast natural playground offering boating, fishing, swimming and exploring – and yet Minneapolis, less than an hour away, is brimming with lively culture and activities. We're just minutes from great schools, all kinds of shopping, restaurants, entertainment, churches and more. There's something for everyone! Since we voted to become a resident-owned community, we have worked hard to improve our community. Our first projects included upgrading our community building, adding a new sign and various infrastructure improvements. We plan to add a bus shelter as well as other community events in the not-so-distant future. Ask anyone who lives in Stonegate Cooperative, and we're sure they'll tell you it's a little slice of heaven.